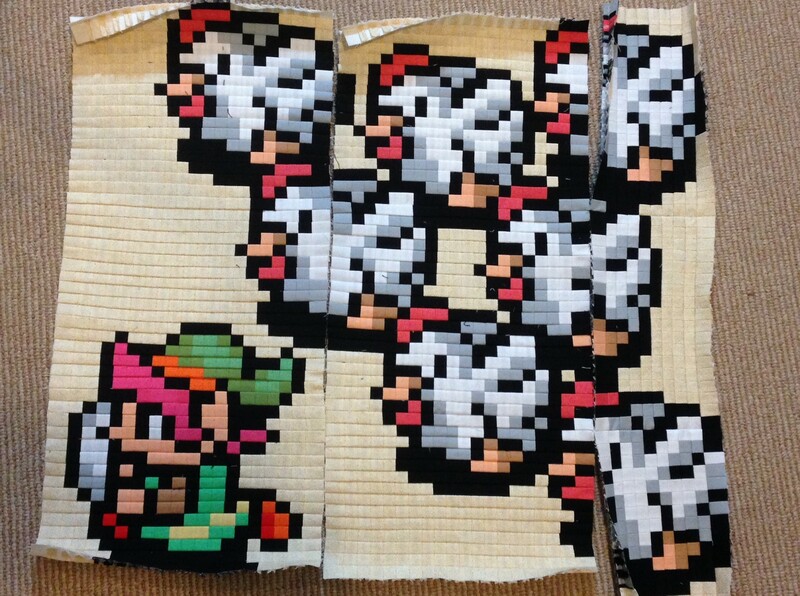 Well, after 6 years, I put the final stitches in the Legend of Zelda cross stitch this week.It’s hard to believe that it’s actually finished. The next steps will be washing and framing it but that’s going to wait for a little bit. The first night after the cross stitch was finished, I didn’t really know what to do with myself. My next project will be a 6″ charity square for Sprite Stitch’s stitching for charity. On the crane front, with these green guys, the total is up to 133. I also had an amazing Goodwill find of this display case. This is the first 100. I know I haven’t been posting much lately. In my non-quilting life, I am an office manager/accountant for a small software company. We were just acquired by Pitney Bowes, and the last few months have been submitting thousands of documents to make the merger happen. I’ve been working 9+ hour days and weekends to get my part together. And now that the deal is closed, I will have more time for quilting, since I sure miss it! I have made some progress on a few things. I finished the quilt top for the Meadow Mist Mystery Quilt-Along. It was a really fun quilt to make and I’m loving how it came out. I’m not sure how I want to quilt it. January is the assembly month, so I caught up with the group and am eligible for the giveaway prizes. Mostly, I have been working on my cross stitch. For the last month, I’ve had enough energy when I get home to put something on the TV and stitch for 30-60 minutes and then pass out. Bad for quilting progress, great for the cross stitch. The letters are wonderful (it will say “Zelda”) since I can do the outline and then mindlessly fill in while I watch something. My life should resume a normal pace and balance now, so there will be more regular updates. I’m getting ready to pattern test a beautiful quilt for Desert Bloom Quilting (more on that later). 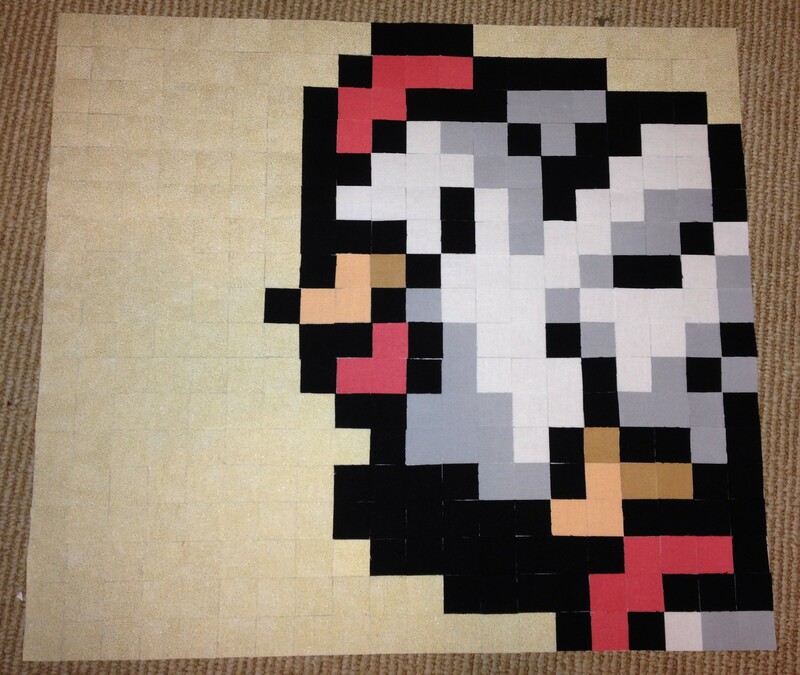 I also have two wedding quilts to put together, and signed up for an NES Block of the Month. Plus, of course, my 2016 Quilt-Along which it’s not too late to sign up for. On Saturday, I mailed my SpriteStitch Mega Gift to my buddy. It’s going overseas, so it will take a week or 2 to arrive. Once it does, I will (finally) post pictures of the things. And, I know I’m biased, but let me tell you that they are fabulous. Meanwhile… today is a Work In Progress day. I joined the Meadow Mist Mystery QAL a few months ago and finally started on it this past week. She offered us the option to peek, which I did. For her quilt, she has 4 colors. For mine, since I know where we’re heading, I’m making each <thing> a different color set. 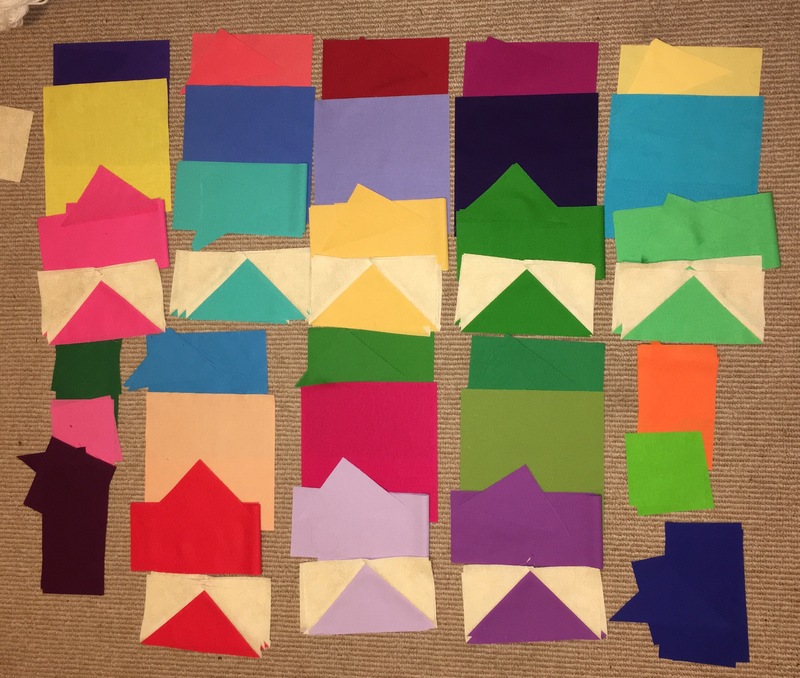 I went through my collection of solids hoping that I might have 30 different solids. I had closer to 40, not counting the box of solid fat quarters, heh. Right now, I’m through the first month (August), which is the flying geese at the bottom of each color set. Month 2 is square-in-a-square units (not pictured). I have one seam left on each SiaS, so I’m hoping to get those done tonight. Month 3, October, is a quick Courthouse Steps block. My goal is to be caught up through October by the weekend. 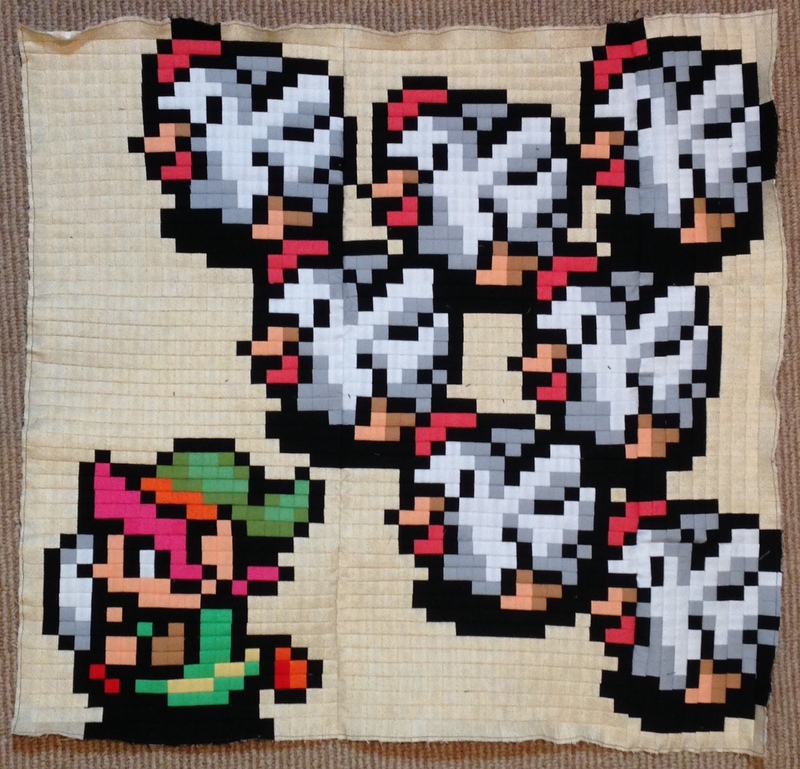 Separately, I’ve also been spending about an hour per night, every night, on my Zelda cross stitch (which I’m surprised I haven’t shared before now). I started on this cross stitch in May 2010. I did the mountains and waterfall over the next 2.5 years and then set this aside. I moved to Seattle and left this in a box at my mom’s house. While visiting this past summer, I dug through my box and found it. I decided that I either needed to finish it or give it away. Since the mountains were the hard part, I decided to push forward. 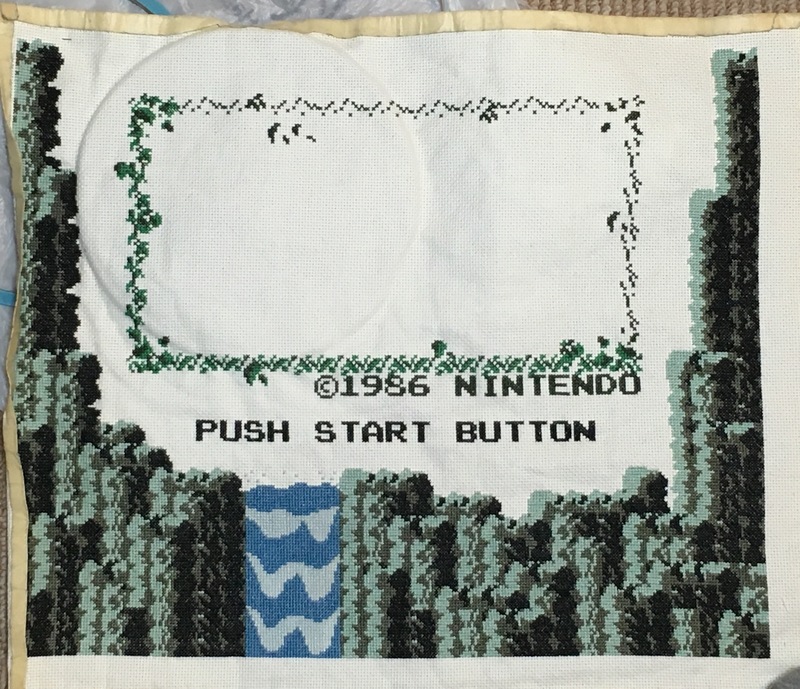 I have since stitched the words and am currently working on the rectangular border. Cross stitching is a little rough on my hands, so I limit myself to 1 hour per day. I’m making steady progress and my plan is to have the green done by mid-November (or 2 sides of the yellow, if I decide I’m sick of the green and fill in yellow instead). I’m participating in a craft exchange through SpriteStitch.com. I’m participating in both the mini and mega swaps. Until our buddies receive their gifts, we’re on a media blackout for talking about what we’re doing. And for me who gets excited about anything and loves sharing, it’s been rough! My mini swap buddy received her gift so I can talk about them. I made her a set of placemats, featuring appliques of some of her favorite games. 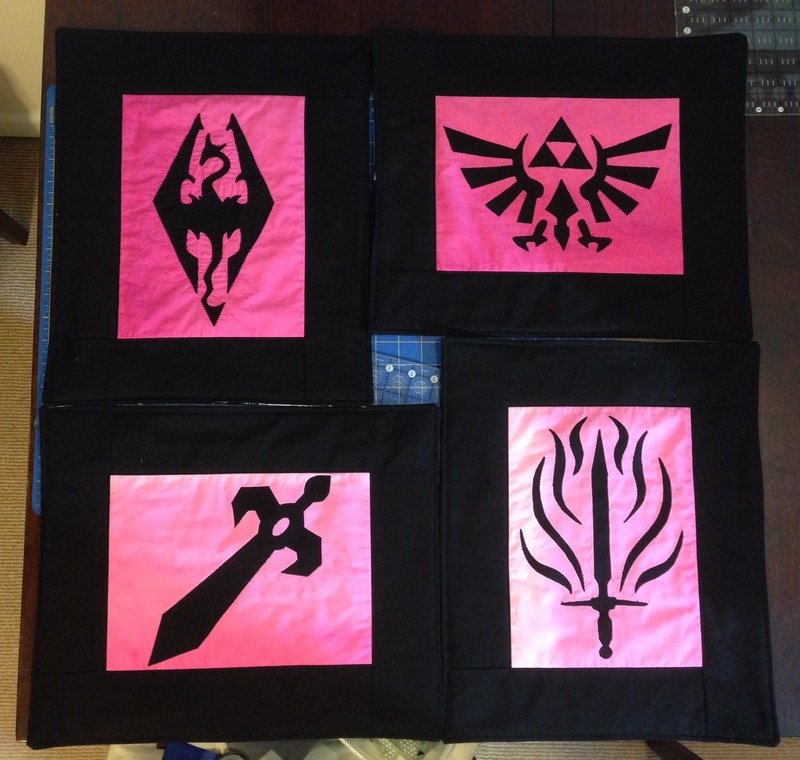 From the top left, clockwise, we have Skyrim, Zelda, Dragon Age, and Fire Emblem. I used the Soft Fuse brand fusible web and then blanket stitched around the edges. The pink fabric is gradated and though it looks like there is some funky lighting from the top two to the bottom two, that’s actually the fabric. The placemats are machine washable. Close up of the rose pocket. 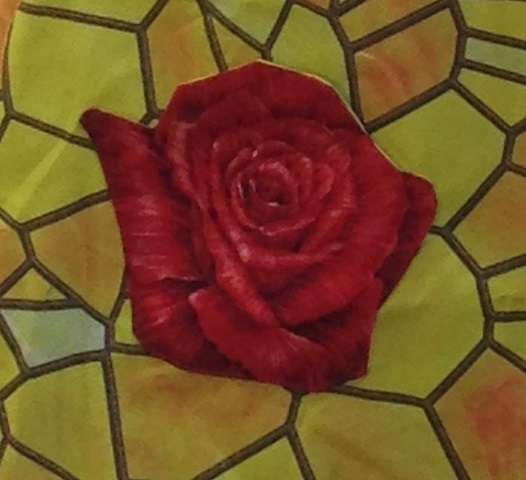 I knew I had this rose fabric … somewhere. I had to dig through all of my boxes to find it but I finally did find it at the very bottom of the last box. But it looks really good so I forgive the fabric for being hidden. The next round of sewing was fast and surprisingly easy. The pressed seams lined up really well and it wasn’t too bulky. However, when I went to cut the seams opened, I had some difficulty. With the prior round’s seams included, there was more bulk than the first time I cut and often the fabric extended farther out than the fusible. This made it a little difficult since the fusible was what I needed to cut through. I had to cut the seams to maybe 1/8″ (instead of 1/4″) and be super careful to not cut through any of the seams. And since there were more layers, it required more pressure (and probably needed a new rotary blade *cough* ). After I cut about 2 blocks, it occurred to me to test being able to press the seams open. Because of how small they were, I couldn’t press them open. But I could press them regularly, which was fine with me because it meant I didn’t need to cut anything else. And by “press regularly”, it was more akin to “smash the panels with an iron until they were sort of in the ballpark of flat”. I smash/pressed each panel into submission. 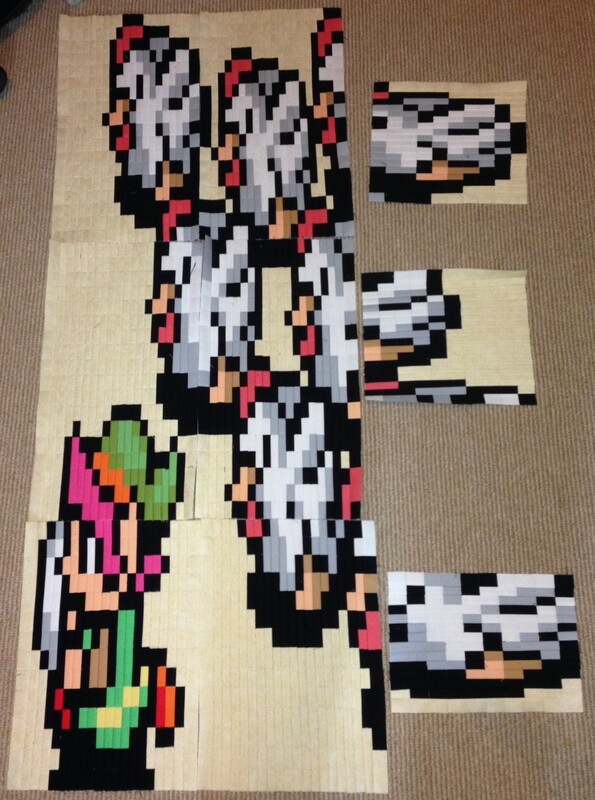 I then attached the rows together and ran into an unexpected problem… one row was longer than the other two. 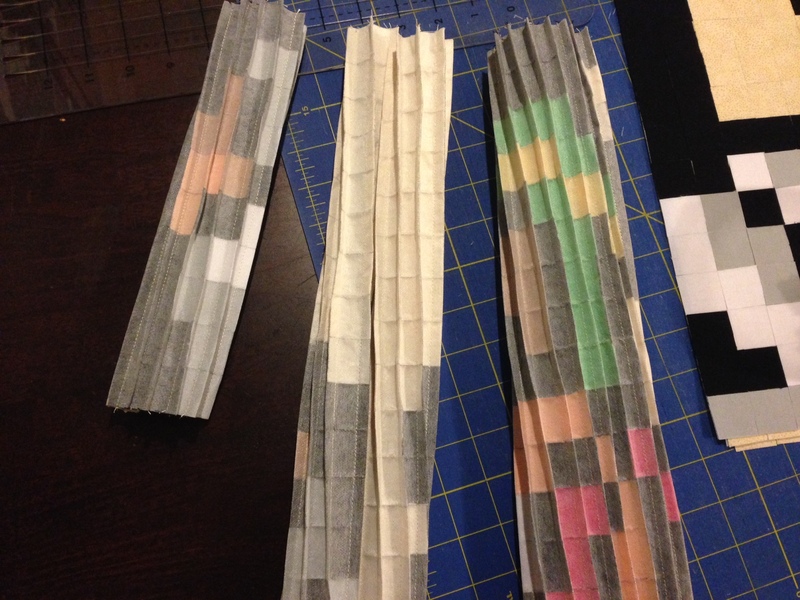 I started with 1″ squares that were supposed to end at 1/2″ but there was some variability. The bigger problem was that there was a different amount of shrinkage for the first round of sewing to the second (I’m not sure if this was due to user error, small size of the squares, or is expected. The tutorial recommends quilt shop fabric to avoid fabric distortion, which I am using, so we can rule that out). When I was all “I’m going to be smart and sew whichever side has more seams first”, it resulted in my sewing the vertical seams of 6 panels and horizontal of 3. Next time, I would sew all of the vertical seams then all of the horizontal. I’d end up with a finished rectangle instead of a square, but better than my trapezoid. I was able to pin the heck out of the longer piece to get it to attach to the smaller one, so it wasn’t a huge deal and when I go to quilt it, I imagine that there will be enough stretch in the left side to get this to look close to a square. The panel is around 23″ (supposed to 25″… close enough!). The project is supposed to have 3 more panels but I’m questioning what I want to do. It was fun to make but a little tough on my wrists. So I don’t know, we’ll see. I was thinking of making a larger one with 1 1/2″ squares since I imagine it’ll be easier to work with. The panel would finish at 50″ (theoretically) and I could add borders and have a quilt that way. 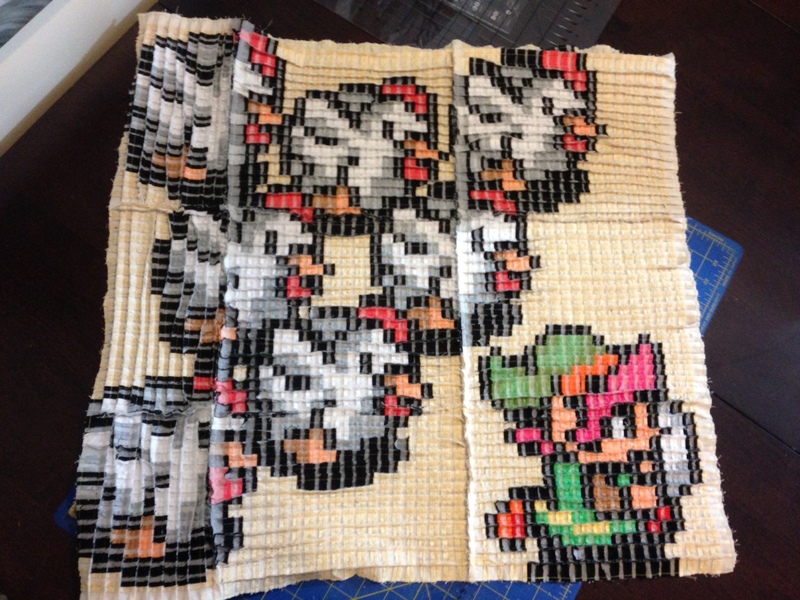 As of last week, I had 3 of the 9 Link panels sewn. I finished sewing the other 6. The seams need to be pressed open to reduce the bulk. Since I’m working with a single piece of fusible for each panel, the next step is slicing a tiny piece off of each seam so they can be pressed open. I flipped each panel over and (very carefully) sliced a tiny little bit off of each seam. Here is the waste off of all 9 panels. It only took me about an hour and a half to cut and I didn’t cut into any of the quilt (phew). 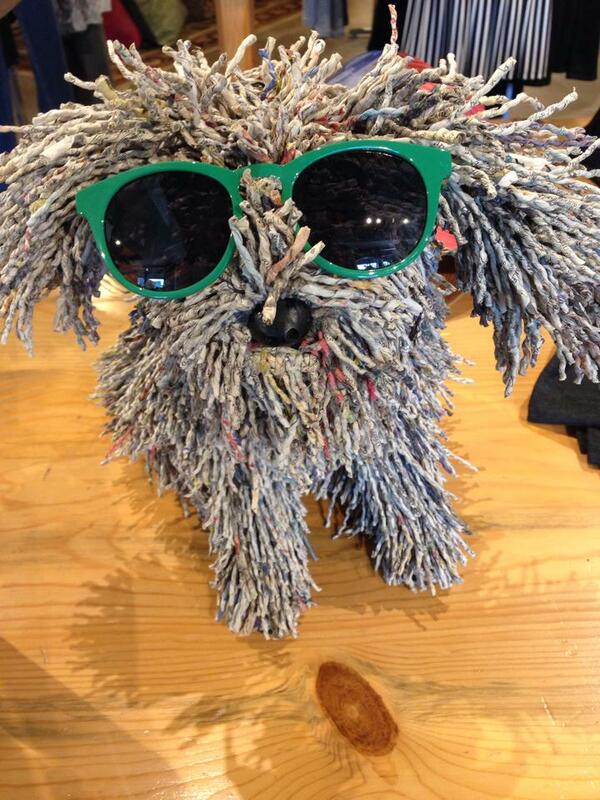 It also reminded me of this dog art I saw last year on Bainbridge Island. I’m wondering how hard it would be to turn those pieces into the dog. Because of the amount of cutting and tools to quickly cut a ton of squares, I knew there was a high probability that I would cut myself. Especially at this stage, my hand was going to be right next to the blade and since I was free-handing it, I bought the Klutz glove on Amazon. [Quick note – none of my links are referral links, so I don’t generate any revenue if you buy something I share. I just want to share the tools I use.] I bought the medium which is a little large, but otherwise, it’s great. 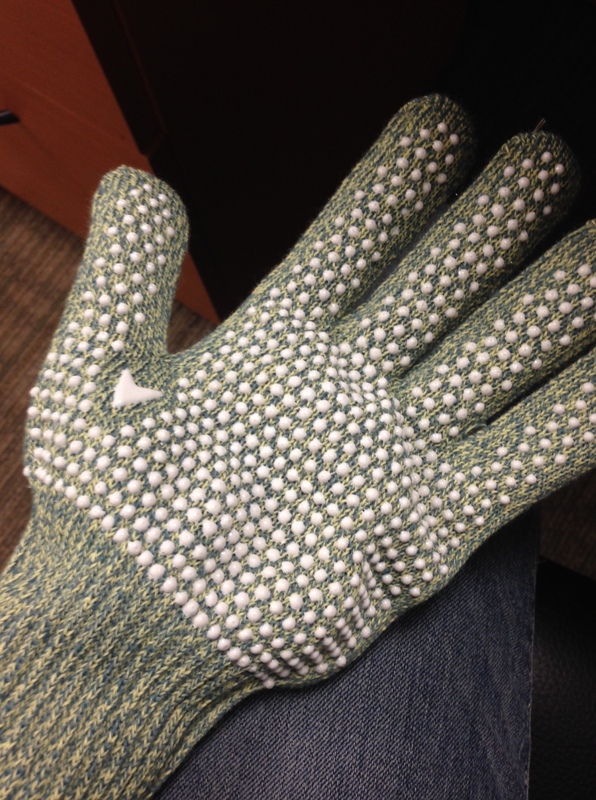 The glove has wire mesh in it to protect your hand and the white grippy dots will hold onto a ruler. What’s interesting is that the front packaging says that it’s to protect your hand from the rotary cutter but the back says it shouldn’t be used with a moving blade. I’m not really sure how that works, but I feel much safer with the glove! After the seams were cut, the next step was pressing them open. For one panel, I tried pressing it to one side and it made it almost impossible to fold over for the next sewing step, so I should have trusted the tutorial. I put something on Netflix and ironed all of my seams open. This is one of the panels. And here are all 9 of the panels laid out. Each square starts at 1″ and finishes at 0.5″. Because of how I sewed the seams, there is the distorted effect in the blocks. After the next round of sewing, everyone will shrink up and fit together, since it looks pretty funky now. Next up: Everything gets run through the machine again and the opposite seams get sewn. Then more cutting and pressing, and the panels will be complete! 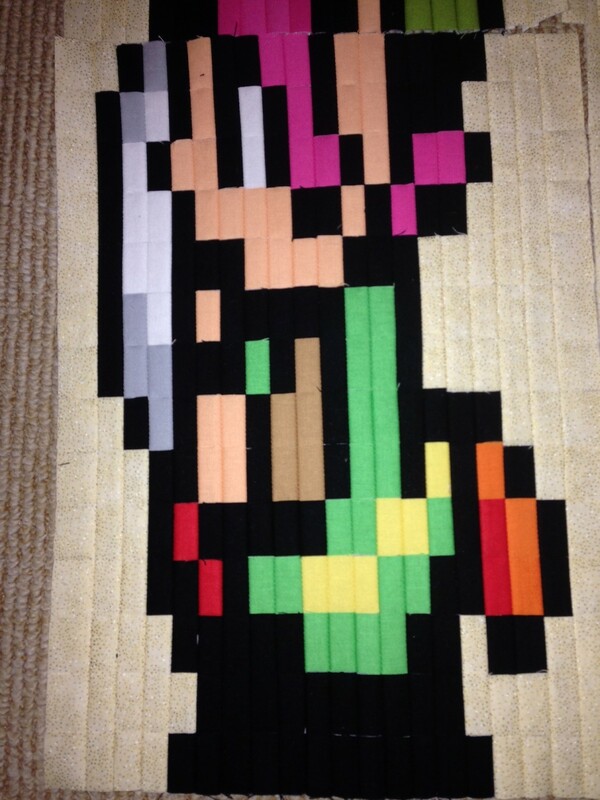 I’m continuing to make progress on Link. I spent a second evening gluing the squares and finished panel 5-9. The last step in the whole process will be attaching the panels. This is a close up of the first panel. You can see how the block looks up close with the squares next to each other. 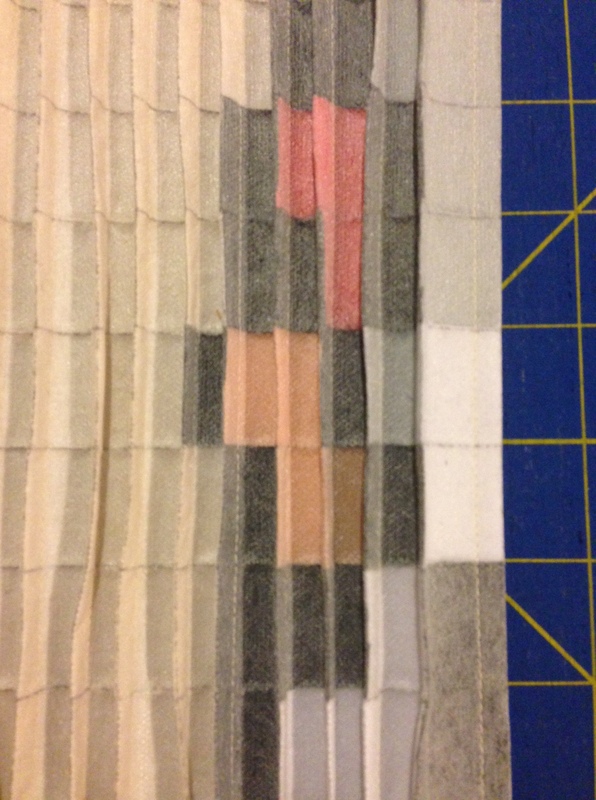 After everything was glued, I folded, right sides together, along the previously drawn lines and sewed a 1/4″ seam. I repeated for each vertical seam. 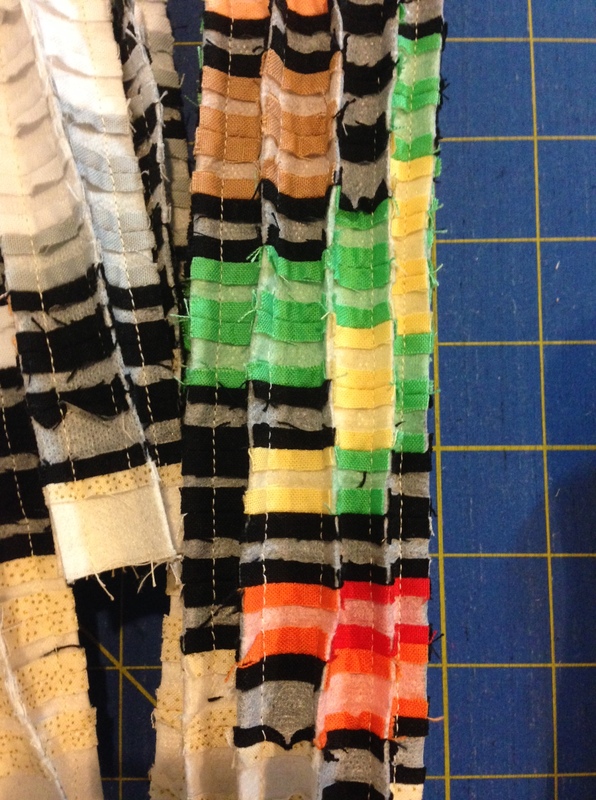 When you sew using a 1/4″ seam, you lose 1/2″ total (1/4″ on each side). My squares started at 1″, so they’re going to finish at 1/2″. 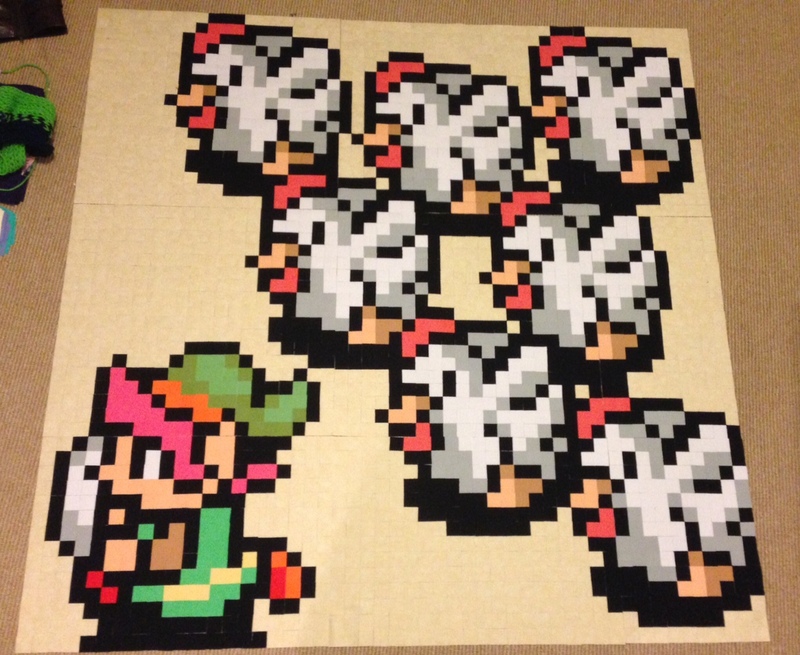 You can see how much the squares are shrinking up compared to their original sizes. These aren’t pressed so the shrink will ultimately be a little less dramatic, but you get the idea. 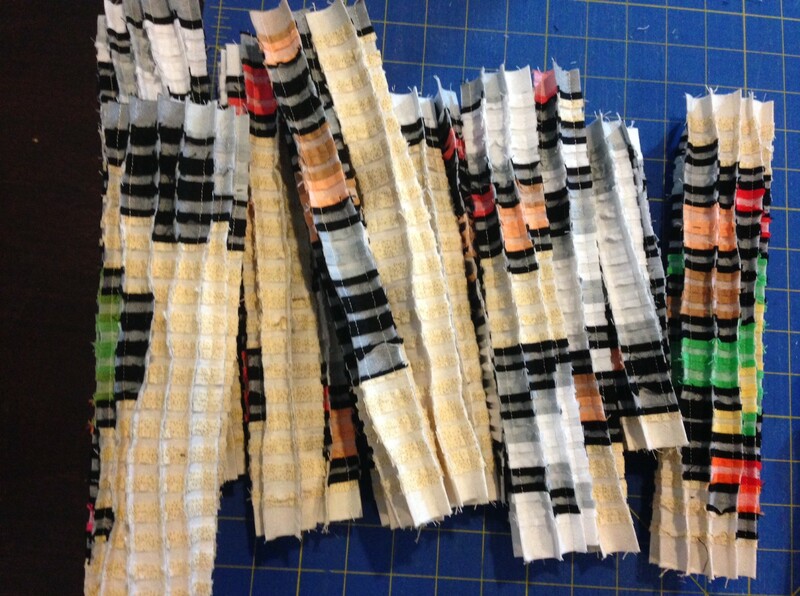 This picture is what the panels look like after all of the vertical seams are sewn. The fabric just folds around itself; it’s pretty cool looking. I was able to finish 3 of the panels last night. Once I get the other 6 completed, the next step will be cutting a tiny piece off of every seam so that I can press the seams open (there will be pictures). I am realizing that I won’t be able to do 4 panels in 30 days so I’m either going to do 2 panels in 30 days and then do some regular piecing to fill in where the other 2 panels would be, or turn this into a 4 panels in 60 days project… we’ll see. I do plan to try to keep up with the original timeline. As a math person, I usually calculate how many seams I’ll need to sew on a project. 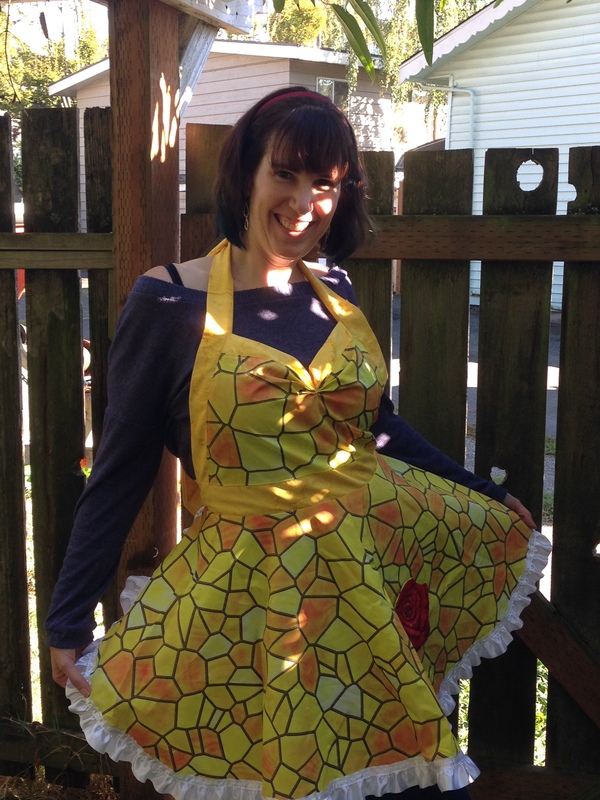 For a regular project (without the fusible), it’s one fewer seam than the number of pieces. So this block is 50 squares x 50 = 2,500 pieces. If I were to have attached this regularly, it would have taken me 2,499 seams. But, with this method, it’s only about 200 seams (and could be fewer if I attached the panels first). 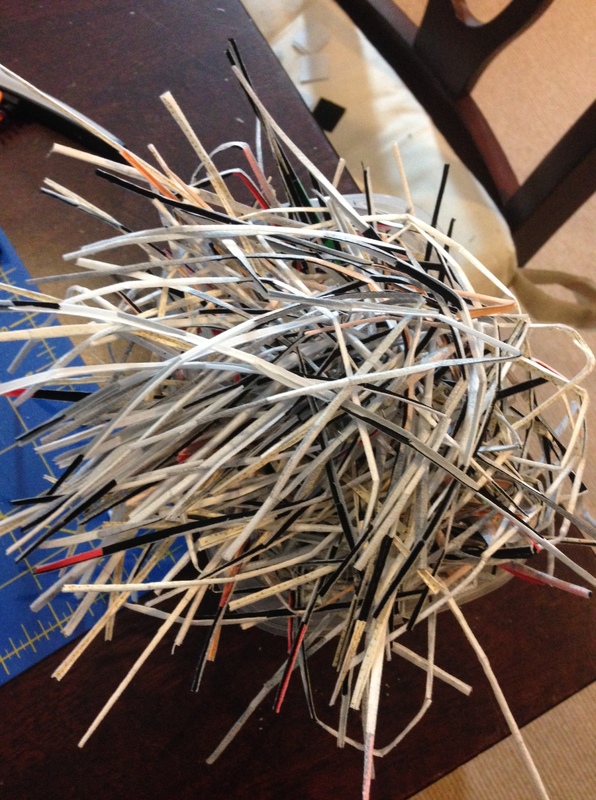 It’s still about the same amount of thread, but so much faster.